Unroll the crescent dough onto a lightly-floured cutting board. 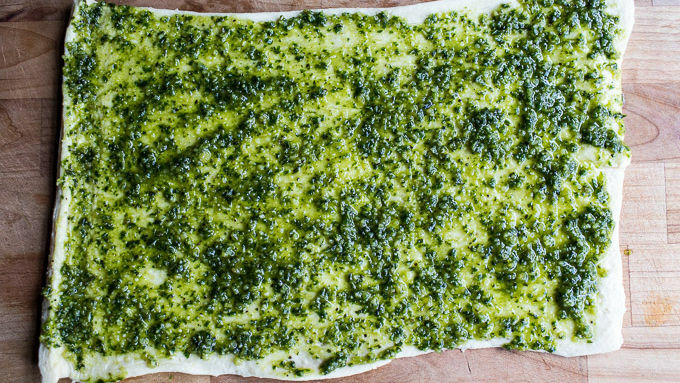 Spread the pesto over the dough, leaving a 1/4-inch border around the edges. In an even layer, sprinkle on the eggs, bacon and cheese. 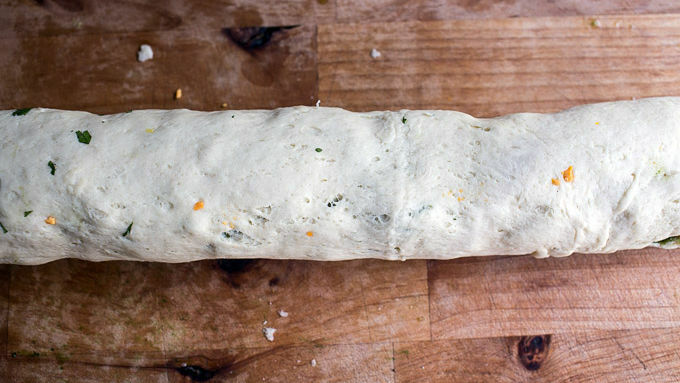 Working with the end closest to you, tightly roll the dough up into a log. Using a sharp knife, cut the log into 12 rounds and place on the prepared baking sheet. Bake for 15 minutes or until lightly golden and the cheese has melted. Remove from the oven and place on a serving platter. Serve immediately. 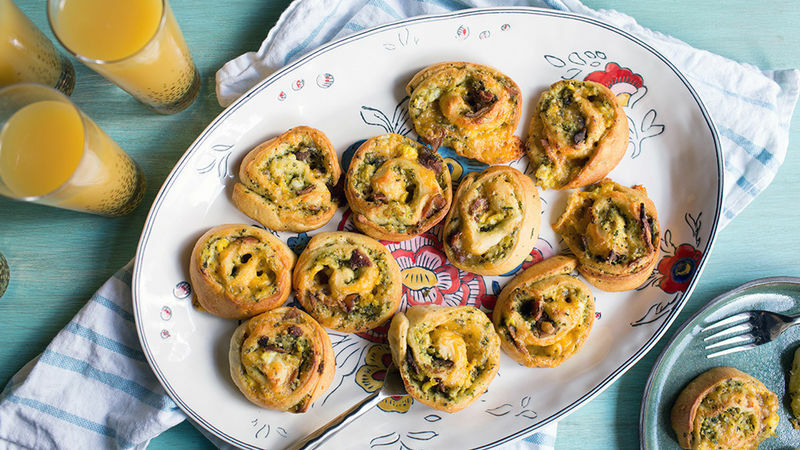 Get creative and add your favorite breakfast items to these rolls. Just be sure to not overstuff them! If serving more than 4 people, I recommend doubling this recipe. 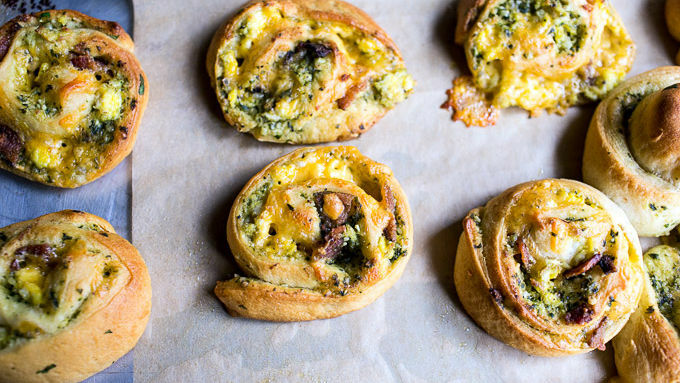 So, how good do these breakfast pizza rolls look? I mean, do you see all that cheese just oozing out? Holy yum! With the weather finally starting to cool, I cannot help but jump for joy that I get to turn my oven on again! Actually, in all honesty I have been using my oven all summer long. What I really mean is I can’t help but be excited that when I do turn on my oven, my little log barn will actually be a nice cozy temperature as opposed to stifling hot. Yay! I just love this time of year when we get to start making cozier foods again. Brunch is totally my thing—and it’s my favorite meal to entertain for. I can eat brunch at any point in the day! 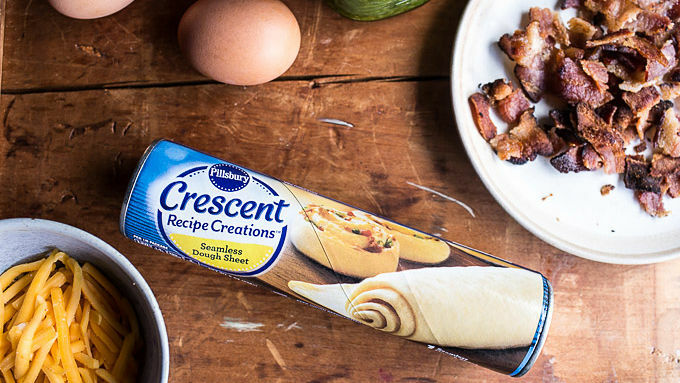 These crazy easy and delicious breakfast pizza brunch rolls begin with Pillsbury™ crescents. 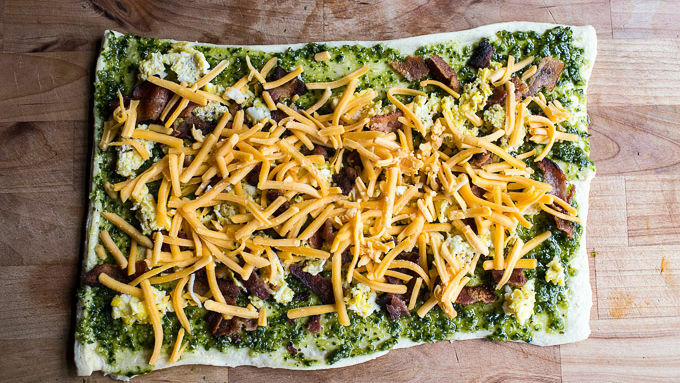 From there you add a little pesto, eggs, bacon and cheese. Roll everything up, slice and bake. It’s as easy as that! You can also get creative with fillings and use your favorite combo of brunch foods. 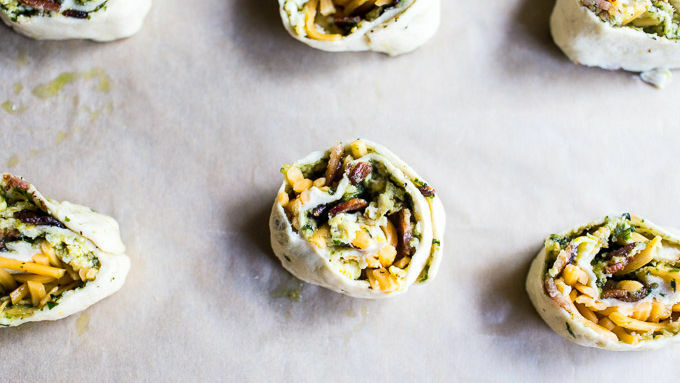 A sun-dried tomato and olive roll would be delish!